CD reviews: "In the Name of the Music Revelation Ensemble" and "Blues Allnight"
These reviews first appeared in the June 2, 1995 issue of the North County Blade-Citizen (now North County Times). 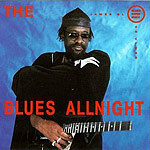 James Blood Ulmer's music sure isn't for the faint-hearted. It's loud, phrenetic, at times angry, and always a challenge to listen to. Two new albums showcase two sides of Ulmer's guitar-based music: his harmolodic approach to jazz (picked up during a long stint with Ornette Coleman) and his heavy electric blues. Ulmer's jazz on "In the Name of the Music Revelation Ensemble" moves with a deeply conveyed passion, an underlying swing that ties the seemingly dissonant themes together, giving his free-wheeling approach a structure upon which to lay down his frantic leads and solos. Guest saxophonists Arthur Blythe, Sam Rivers and Hamiet Bluiett blow as fiercely as Ulmer picks, giving the album an intensity that can exhaust the listener! On his blues set, he's mixed in some heavy metal elements  not so different from what Living Colour's Vernon Reid or The Kinsey Report have done in melding contemporary urban themes with the grandiose, almost operatic scale of heavy metal. It is harder driving than even most metal, though, and with a funkier backbeat. The blues album is definitely more accessible than the jazz outing, although you'll still need a fairly open attitude toward the music to appreciate what Ulmer is after.